A collaboration between experts at numerous NASA centers and commercial companies have created a plan for an “in-space LO2/LH2 PTSD (Propellant Transfer and Storage Demonstration) mission, to affordably support a 2015 demonstration and follow-on missions”, highlighting an exploration architecture built around existing vehicles and Propellant Depots. 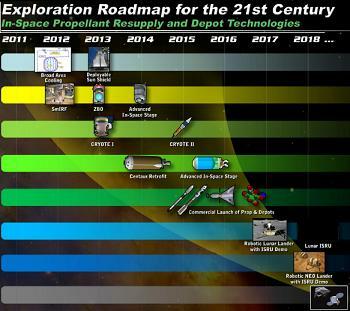 Answering a Request For Information (RFI) in June, a broad range of NASA, other US government, academic and industrial participation resulted in a roadmap to enable a flagship demonstration mission of propellant storage and transfer ability in 2015. Such a mission would build on the United Launch Alliance (ULA) exploration master plan, which removes the need for a Heavy Lift Launch Vehicle (HLV), instead combining the use of current EELV (Evolved Expendable Launch Vehicle) vehicles – such as Atlas V or Delta IV – with an on orbit ability to refuel in space via fuel depots. “We as a group strongly believe that the use of orbital propellant transfer and storage (Depots) provides a breakthrough in space transportation enabling truly affordable, sustainable and flexible exploration to destinations beyond low Earth orbit (LEO),” noted the executive summary of the presentation – acquired by L2. Strategically placed at one or more Lagrange points, such depots would remove the need for vehicles to launch with all the propellant required to complete a mission – one of the primary reasons for very large launch vehicles, due to the mass of the propellant they have to launch with. “Propellant depots offer near-term ability to support demanding space missions without the expense of developing very large rockets to support each new mission. They also enable reuse of in-space stages and provide a market large enough to encourage access to orbit innovation,” noted the presentation. Although the political refinements to the FY2011 budget proposal are ongoing, supporters of a flexible path exploration architecture note that propellent depots can save up to 57 percent of the launch mass being reserved for fuel, when undertaking high energy missions. Options remain open on which propellents could be used, although all large-scale robotic and crewed beyond LEO missions propose the use of high efficiency LO2/LH2 propulsion for the majority of their propellant needs in LEO – as noted by the executive summary, and large sections of the presentation. Commonality with NASA’s own “Flexible Path” approach to exploration – a large presentation created after the Augustine Committee’s review into Human Space Flight – can also be found as part of the foundation of the PTSD FTD conclusions, which utilizes Orion with an EELV Upper Stage, such as the Atlas Centaur or the Delta Cryogenic Second Stage (DCSS). “The crewed missions that NASA might conduct this decade are GEO, Lagrange points, lunar and NEOs. NASA will likely rely on Orion’s propulsion module, with storable propellants, for the return propulsion. 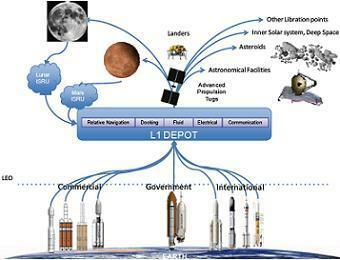 Our recommendation is that NASA’s depot flagship mission focus on the storage, transfer and handling of LO2/LH2. Historical and current experience are also cited as a positive in enabling a low risk approach towards the propellant depot FTD, with numerous Cryostats already in use or under development for scientific satellites, demonstrating the ability to efficiently store cryogens for long durations. 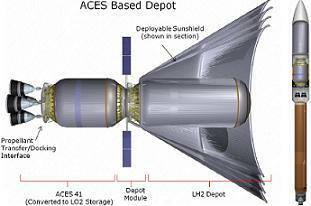 “America’s existing CFM capability is based on decades of experience storing LH2/LO2 in launch vehicle upper stages. This historic flight experience suggests that with proper design, a propellant depot can efficiently store large quantities of cryogenic liquid, including LH2, for years. The presentation also claims a simple LO2/LH2 depot – derived from existing hardware and CFM experience – can demonstrate all of NASA’s PTSD objectives within a $500m budget in under five years. “Several groups have independently determined that LO2 and LH2 can be stored efficiently in a compact, light weight, affordable depot design. The simplicity of these depot concepts could support NASA’s 2015 PTSD demonstration mission. The depot could be launched on an Atlas 551 and stay within the proposed budget and schedule. The key to such a depot design is segregating the LO2, LH2 and warm equipment module. Transverse spinning of the entire depot at ~1 degree per second would also provides a settled fluid environment that simplifies the cryo-fluid storage and handling. The aforementioned simplicity of the design – along with current technology of the EELV upper stage – are noted as key drivers for keeping the cost and schedule risk low. “The LH2 module includes a large tank with minimal penetrations. This tank is connected to the mission module by six low conductivity composite struts. These struts, fluid transfer plumbing and wiring are vapor cooled to minimize heat reaching the LH2,” the presentation continued. “The entire tank is encapsulated in a robust, IMLI (insulation) blanket incorporating broad area cooling and MMOD protection. “The LH2 module is launched empty and filled on orbit with Centaur residual LH2. Launching the LH2 module empty allows the module and adapter to be designed for orbital requirements and not ground and ascent environments. The LH2 module requires no foam insulation and the payload adapter structure can be very light weight and thermally efficient. Based on Centaur mass properties this LH2 module should weigh ~1 mT and have a 4.5 mT LH2 storage capacity. “To minimize cost and schedule, the LH2 module can be derived from a Centaur tank. This allows hardware to be procured and outfitted in 2010/11 with large scale thermal vacuum testing starting as early as 2011. Near term experience with the system provides risk mitigation that is critical to a successful 2015 demonstration mission. 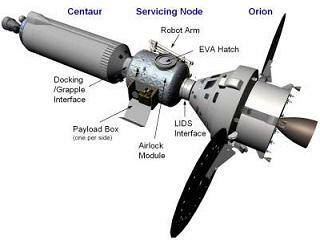 “Between the Centaur and the LH2 module resides the mission module. This module includes the solar panels, fluid controls, avionics and if desired, an orbital transfer vehicle (OTV) interface and remote berthing arm. The mission module could be derived from NASA’s planned automated rendezvous and docking (AR&D) demonstration vehicle. “Alternatively the mission module could consist of a standard Atlas payload adapter containing avionics derived from existing spacecraft such as LCROSS, Orbital Express or XSS-11. The LO2 is stored in Centaur’s large LH2 tank. Storage of the LO2 in Centaur’s LH2 tank simplifies long duration, minimum boil-off storage. 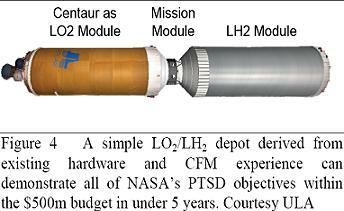 For the PTSD mission, the LH2 and LO2 are provided as residuals from Centaur. Launching the PTSD on as Atlas 551 provides ~12 mT of combined LH2/LO2 residual if the PTSD weight is optimized, the presentation noted. Efficient system design, fluid in-flow into a tank, vapor cooling, integrated multi-layer insulation (IMLI) (incorporating micro-meteoroid and orbital debris (MMOD) protection and broad area cooling), transfer tube connection, subcooling and combined system operation are the critical technologies that must be demonstrated. The Integrated MLI that provides enhanced thermal and MMOD protection is an innovative new technology where polymer substructures are integrated with radiation barriers to provide improved high performance cryogenic thermal insulation systems. IMLI is noted as having a significantly enhanced structural integrity and performance compared to standard cryogenic MLI. “Standard MLI blankets have a surprisingly high level of protection from the impact of MMOD. The incoming particle is broken apart by the initial impact, and the resulting debris cloud is further retarded and broken up as it progresses through each layer. 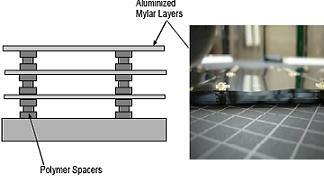 IMLI enhances standard MLI MMOD tolerance by combining increased and controlled spacing between layers and slightly thicker layers than standard MLI blankets. As intimated in the executive summary, the technology required to reduce the amount of LH2 boil-off from the depot is one of the key elements in the forward planning of such an architecture. Options such as Vapor Cooled Shields (VCS) – using tank boil off (passive) or cryocoolers (active) – can be used to provide cooling. VCS systems have been flown by Ball Aerospace – who were one of the commercial companies involved in the presentation – on LH2 PRSA tanks. “To incorporate passive cooling technologies, a combination of VCS and in-line para-to-ortho conversion can minimize boil-off losses from LH2 storage tanks. As a passive technique, VCS using cold evaporated hydrogen gas significantly reduces the amount of heat leakage into the LH2 storage tank over long mission durations. Para-to-ortho hydrogen conversion is an endothermic process which adsorbs heat. “The VCS with a para-to-ortho converter can generate additional cooling and create a refrigeration effect to reduce boil-off of LH2. An integrated VCS, with a parato-ortho hydrogen converter, must be analyzed, designed and ground tested in order to demonstrate its advantage for the cryogenic flagship propellant depot. 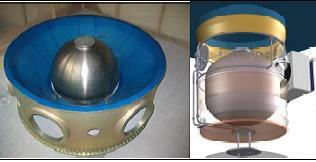 Broad Area Cooling (BAC) – investigated by NASA between 2004 and 2006 under the In-Space Cryogenic Propellant Depot (ISCPD) Project to substantially reduce or entirely eliminate boil-off losses with a minimal increase of total system mass – might also be integrated with cryogenic propellant storage tanks. Also, other options, such as subcooling propellent below their boiling point at atmospheric pressure prior to launch, and enhanced analysis tools incorporated in cryogenic propellant utilization (PU) capability – which predicts the thermodynamic state of an on orbit cryogenic upper stage requires a high degree of fidelity – are also examined in the presentation. 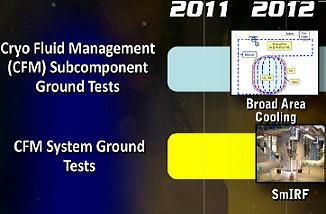 Ground testing would be a key element to a successful demonstration mission, while also reducing the risk involved. The importance of ground testing the new technologies received a large overview in the proposed path outlined in the presentation. “Relying on numerous new technologies on a single flagship mission is a recipe for failure. A combination of ground component development and system tests in parallel with low cost rideshare demonstration should be pursued concurrently with the flagship depot development. Should NASA’s forward path include Propellent Depots, several existing facilities would be put to good use, such as the Cryo-Fluid testing of Centaur tanks at the ULA facility – which can provide invaluable data on the actual performance of proposed thermal protection schemes. “Many features of the advanced thermal protection system required to allow long-term, large scale cryogenic storage can be demonstrated on the ground. IMLI, vapor cooling, BAC, light weight tank structures can be effectively demonstrated on the ground. “This ground testing is directly applicable to orbital depots that rely on settling to handle the fluid-gas interface and is useful for zero-g cryogenic storage. 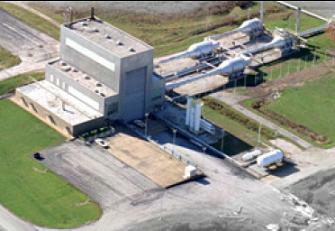 “While much has been learned from the multi-purpose hydrogen test bed testing conducted at MSFC (Marshall Space Flight Center), it is crucial that further ground testing utilize structures that are representative of flight systems, not 0.5 inch thick ‘boilplate’ aluminum tanks where substantial wall conduction influences the results. While ULA are listed as offering NASA the loan of a Centaur tank, NASA’s Plum Brook B2 facility classed as “perfect” for large scale integrated testing. “NASA (GRC, KSC, MSFC, JSC, Ames and GSFC) and ULA are collaborating to pursue such testing at in NASA’s B2 vacuum chamber. ULA has offered to loan NASA a Centaur tank – which would allows for ground based system testing to begin as early as 2011, whilst arriving with its long flight history to boot. “Centaur’s 194 flights provide a vast database, both settled and zero-g, with which to anchor ground test data. Centaur’s low thermal structural mass and low conductivity are critical for long duration flight cryo-storage tanks. 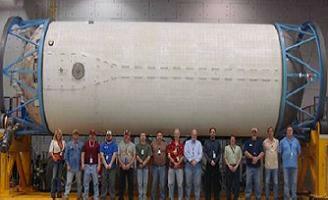 Equally important it is possible to duplicate thermal protection enhancements tested at Plum Brook on upcoming flights thanks to the Atlas’s ability to encapsulate Centaur in the payload fairing during assent,” the presentation continued. Orbital demonstrations are also noted, with a specific reference to the CRYogenic Orbital TEst (CRYOTE) – which offers a near term, low cost method to demonstrate in-space propellant depot CFM technologies. Several NASA, DoD, and commercial missions with launch dates beginning in 2012 have been identified as candidates, and its compact geometry and minimally intrusive, light weight design make it compatible with numerous upcoming Atlas missions. “The CRYogenic Orbital TEst (CRYOTE) concept utilizes a very creative rideshare implementation to allow demonstration of cryo-fluid transfer, long duration storage and a host of CFM technologies while minimizing the impact to the launch vehicle. CRYOTE rides inside the Atlas V payload adapter, similar to how LCROSS’s hydrazine tank was mounted. “Following payload delivery, residual LH2 (or LO2) is transferred from Centaur into the CRYOTE tank. The act of transferring the LH2 from Centaur requires chilldown of the transfer lines and storage tank while demonstrating the ability to fill a receiving vessel. Playing to the current FY2011 budget proposal – and indeed several elements of the proposed changes via at least the Senate bill – the presentation notes the CRYOTE project includes the involvement of nearly every NASA center, academia and several companies. “CRYOTE provides a successful example of how we all benefit from collaboration. In addition to orbital rideshare opportunities, some of the emerging reusable suborbital vehicles, such as those under development by Masten Space Systems, Armadillo Aerospace, XCOR, and others can provide platforms for short-duration (3-5min) microgravity CFM experiments. The use of propellant depots in a future architecture do hold a good level of support throughout the future path proposals. One of the more recent mentions came via the expansive SD (Shuttle Derived) HLV (Heavy Lift Launch Vehicle) assessment presentation, when it referenced a joint role of working with commercial and international vehicles in a Beyond Earth Orbit (BEO) architecture. By way of providing benefits to Lunar and Deep Space missions, the 726 page presentation (L2) – which was the final assessment of the SD HLV, prior to the very recent restart of assessments to note additional information on the In-line SD HLV – noted the addition of propellant deports would significantly improve the overall exploration architecture. Their approach notably differs by way of the depot being launched by a single HLV to L1, for it then to be refuelled using commercial vehicles, reducing the mass required to launch from Earth’s surface on a Lunar or deep space mission via ‘dry’ – and potentially reusable – landers. A HLV – of any kind – is not listed in any current ULA or commercial documentation, with experts claiming such a vehicle isn’t required under the EELV and propellant depot architecture.